USCIB provides key platforms for American business to participate in – and influence – major multilateral discussions and negotiations. As sole U.S. affiliate of the International Chamber of Commerce (ICC), the International Organization of Employers (IOE), and the Business and Industry Advisory Committee (BIAC) to the OECD, USCIB presents informed business views and solutions to government leaders and policy makers worldwide. 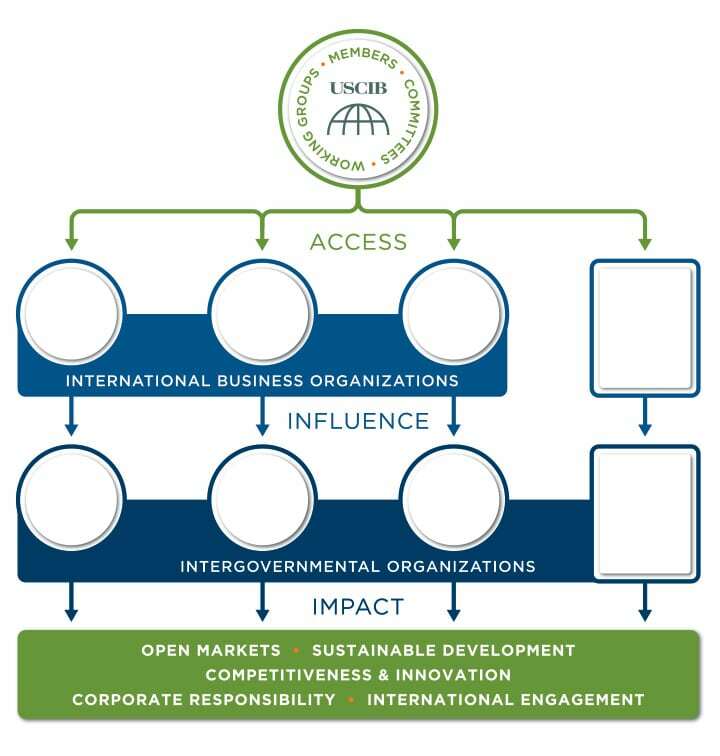 USCIB’s unique global network of business affiliates provides unparalleled access to international policy makers and regulatory authorities worldwide. Our members’ views are heard in national capitals and at major international economic forums around the world. No other American organization can provide comparable channels for business to interface with key inter-governmental bodies such as the United Nations, the Organization for Economic Cooperation and Development, and the International Labor Organization. ICC, IOE and BIAC act as important global business forums in their own right. USCIB’s global approach begins at home, with Congress and the Executive Branch. We have established relationships with key U.S. government departments and officials, who look to USCIB for solid business analysis on key issues affecting U.S. commercial interests and the international economy. Our advocacy role is enhanced by an extensive international network of business affiliations, through which USCIB pursues world business consensus and leadership on critical international economic issues, while we ensure that business views are communicated to international decision-makers and institutions.